South Korea’s parliament on Friday voted to impeach President Park Geun-hye, holding her responsible for acts of corruption by her confidante Choi Soon-sil and for neglecting her duties as the nation’s elected leader. Park was suspended from her duties as president at 7:03 p.m. the same day. The fate of her presidency now rests with the nine judges of the Constitutional Court, who will review whether her alleged wrongdoings warrant her removal. While the court deliberates, Park is suspended from office and Prime Minister Hwang Kyo-ahn will step in as acting president. The ballot started at 3:25 p.m. and did not involve any commotion on the floor. The motion passed the parliament in a 234-56 vote. Two abstained and seven votes were invalid. With Park suspended from office, Prime Minister Hwang Kyo-ahn will become acting president. The nation’s Constitutional Court will now open the country’s second presidential impeachment trial to decide on whether Park should be permanently removed from her elected post. The court must rule within 180 days. In response, Park said she would “seriously” accept citizens’ voices and hope for an end to national “confusion” sparked by her scandal. “From now on, I will calmly respond to an impeachment trial at the Constitutional Court and an independent counsel probe in accordance with the procedures laid out in the Constitution and the (related) law,” a solemn-looking Park said, presiding over a Cabinet meeting after the parliamentary vote. Key charges against Park listed in the impeachment bill included leaking confidential documents to her civilian friend Choi, letting her meddle in key state affairs and top personnel decisions, and allowing her to force conglomerates to donate funds or offer benefits to Choi and her associates. She is also suspected of exerting pressure upon media companies that reported on Choi‘s wrongdoings and of failing to issue rescue orders at the time of the Sewol ferry sinking. “President Park Geun-hye has not only forgotten her duty as the nation’s leader and administrative chief but also violated the Constitution and other laws concerning her public duties,” said Rep. Kim Kwan-young of the People’s Party, presenting the impeachment bill to the floor. 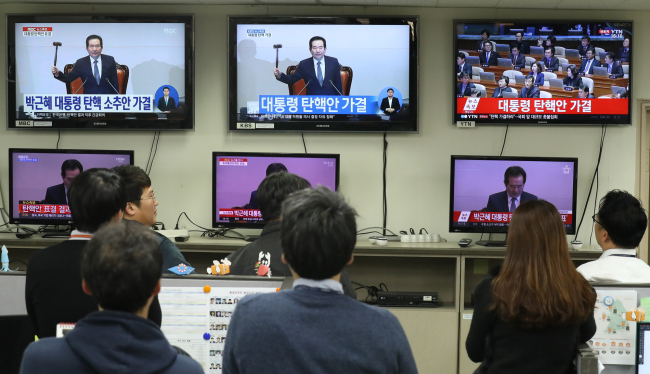 Prior to the vote, the main focus was whether the number of consenting ballots from the ruling Saenuri Party would reach 28, the minimum required to secure the two-thirds majority needed to pass the impeachment bill. The outcome – 234 ballots for impeachment – means at least 62 had cast a yes vote, far exceeding expectations. The three opposition parties, which joined forces to oust Park, hailed the passage of the impeachment motion. Some members went a step further, calling on Park to resign now to spare the country from a monthslong impeachment trial. “The impeachment of Park is only the start (of normalizing the country). Park should give up everything and make the decision to accept the voice of the people and the parliament,” said Moon Jae-in, former head of the Democratic Party and potential contender for next year’s presidential race. The mood was somber in the governing Saenuri Party, whose division was laid bare in the impeachment vote. “This is regrettable, and an unfortunate incident for our history. The confusion in state affairs must end here,” said Rep. Chung Jin-suk, the floor leader of the ruling Saenuri Party. Rep. Kim Moo-sung, a former party head who led a group of Saenuri rebels advocating Park’s impeachment, said he would await the Constitutional Court’s verdict. “We apologize for failing to prevent confusion as the ruling party,” the Saenuri Party said in an official statement, adding it will focus its efforts to renew itself and learn lessons from the past. 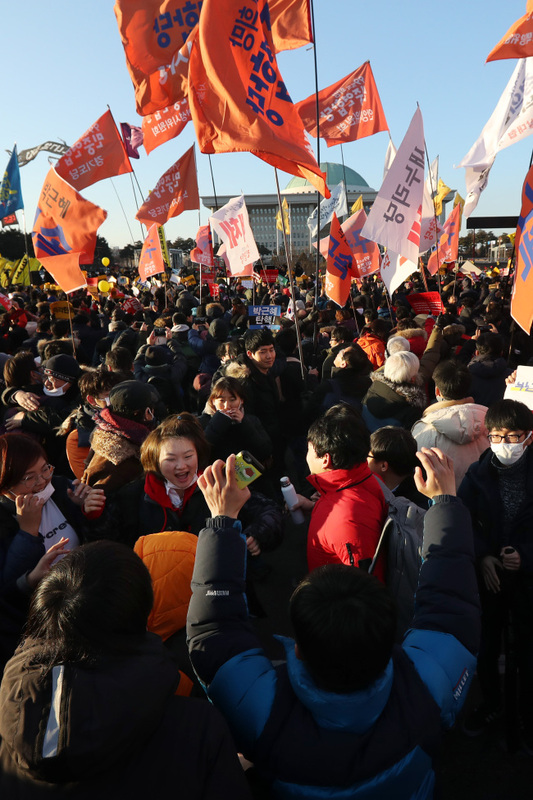 Citizens who have been rallying in massive numbers against Park rejoiced at the news, while Park’s staunch supporters called the parliamentary impeachment a “witch-hunt” without concrete evidence of Park’s wrongdoings. Some of them have gathered outside the National Assembly, demanding the impeachment bill’s passage or opposing it. While the legislature bustled over the watershed vote, the presidential office of Cheong Wa Dae kept a resigned silence. The president was thought to be in her residence, away from the operation offices and the press office, watching the parliamentary vote on television. Outside the Assembly hall where the voting session was held, some 40 family members of the Sewol ferry victims watched on as lawmakers cast their secret ballots. “We have realized that truth (concerning the Sewol accident) may never come to light as long as the Park administration is in charge,” Yoo Kyeong-keun, the committee head of the Sewol Families for Truth and a Safer Society, told reporters before entering the hall. The impeachment motion accuses Park of neglecting her duty to protect the lives of the people for failing to properly response to the 2014 ferry sinking, which killed nearly 300 people onboard, mostly teenagers on a trip to Jeju Island.